File Types: JPG,EPS,All Files; File Size: 1.14 MB; Requirements: Adobe CS1+; Vector: Yes. 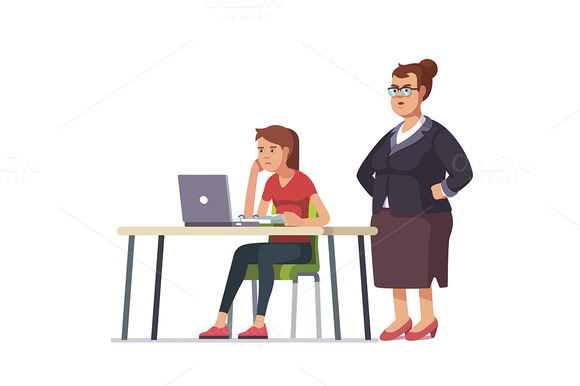 Fat boss woman looking over a shoulder on a weary, sleepy and exhausted employee working on a laptop computer sitting at office desk. Flat style color modern vector illustration. Keywords: 3d, realistic, flat, icon, vector, object, isolated, illustration, template, background, design, cartoon, metaphor, clipart, character, school, schoolchild, student, pupil, learner, grade, graduate, high, desk, undergraduate, senior, higher, university, college, uni, schooling, education, learn, learning, scholarship, study, studying, knowledge, educational, educating, sitting, standing, watching, chest crossed arms, teacher, teaching, educator, tutor, schoolmaster, instructor, mentor, pedagogue, professor, prof, director, principal, holding head, sad, depressed, guilty, culprit, unhappy, sleeping, misbehaving, wearing glasses, angry, looking, tired, exhausted, bored, weary, teen, teenager, young, laptop, working, homework, boss, fat, lady, over shoulder, computer, casual, employee, office, reading, reader, person, people, supervisor.